Need a Toyota Filter? We’ve got them! 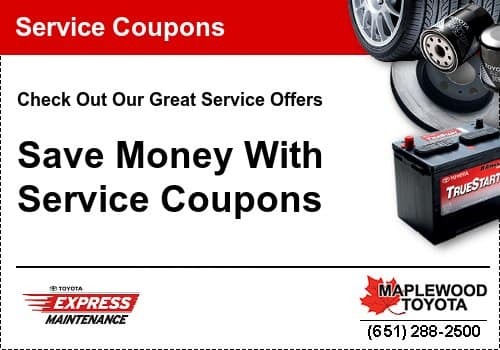 Need Toyota filter service performed? Call our Toyota Service Department at (651) 288-2500 and Schedule a Toyota Filter Service Appointment today. Toyota Oil Filters and regular Toyota Oil Changes reduce wear on critical engine components and help to maintain proper oil viscosity. The results include extended power, performance and engine life with lower long-term maintenance costs. Your Toyota was designed around high performance, quality and value. Regular oil changes with new Toyota Oil filters will help keep it that way. Genuine Toyota Oil Filters are designed to meet the exact flow rate, filter quality, and oil capacity specifications of your Toyota. Toyota Engine Air Filters help protect your vehicle’s engine from airborne contaminants that can cause excess wear and damage. Regular engine air filter replacement will extend engine life while maintaining proper performance, efficiency and fuel consumption. Toyota Cabin Air Filters help to remove pollen, dust and soot out of your Toyota’s passenger compartment. With a new cabin air filter, you and your passengers will enjoy a more comfortable environment while driving. Maplewood Toyota also provides a Toyota premium cabin air filter that comes with active charcoal to help neutralize odors. Order a Toyota Oil Filter, Toyota Engine Air Filter or Toyota Cabin Air Filter from our Toyota Parts Department. Want to schedule a Service Appointment to have your Toyota Filter replaced? Whether it be a Toyota or Scion, your vehicle will receive proper care by Toyota trained technicians using Genuine Toyota Parts.